Chapter 7 Bankruptcy or Chapter 13 Bankruptcy? Which Bankruptcy Option Is Right For You? The first step in the process of filing for bankruptcy is determining which chapter is best to file for your situation. Chapter 7 bankruptcy is a total liquidation bankruptcy that wipes out most of your general unsecured debts such as credit cards and medical bills without the need to pay anything back. You must qualify for Chapter 7 bankruptcy by meeting certain income requirements. If you make too much money, you’ll have to file under Chapter 13 bankruptcy instead. The amount of debt you have is not be a factor in whether or not you qualify for Chapter 7 bankruptcy. A bankruptcy trustee is appointed to administer your case. The Chapter 7 trustee will review your bankruptcy papers and supporting documents to make sure that everything is in order. The Chapter 7 trustee will also seize and sell your nonexempt property (property that you can’t protect with a bankruptcy exemption) to pay back your creditors. If you don’t have any nonexempt assets for the Chapter 7 trustee to take, then your creditors receive nothing. Due to Texas’ generous exemptions, Chapter 7 bankruptcy works well for most Texans. In fact, most Texans that file Chapter 7 bankruptcy don’t lose any of their assets. Chapter 13 bankruptcy is a reorganization bankruptcy designed for debtors with higher incomes who have enough money left over each month to pay back at least a portion of their debts through a modified repayment plan. 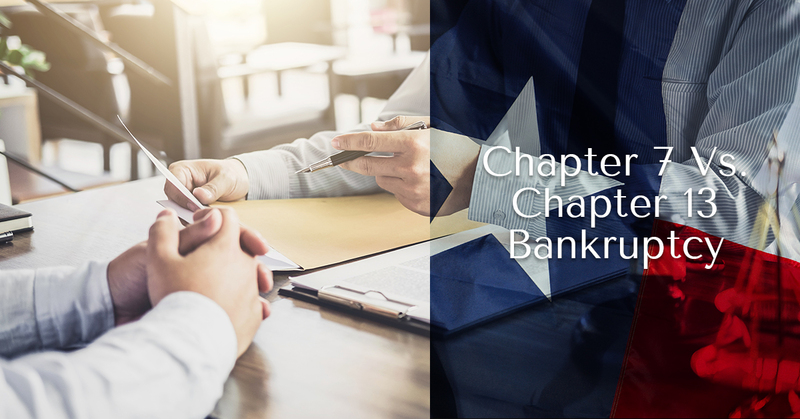 Even though most Chapter 13 filers make too much money to qualify for Chapter 7 bankruptcy, some debtors choose to file for Chapter 13 bankruptcy because it offers some debtor benefits that are not available in a Chapter 7 filing. Some benefits include the ability to catch up on missed mortgage or car payments, wipe out wholly unsecured junior liens from your house or if you owe more on your car than it’s worth, you may be able to just pay off the value of your car and not the whole balance owed. Additionally, in a Chapter 13 bankruptcy, you can keep all of your property, including nonexempt assets, although you’ll have to pay unsecured creditors an amount equal to the value of your nonexempt property. In a Chapter 13 bankruptcy, you pay back all or a portion of your debts through a repayment plan. The amount you must pay back will depend on your income, expenses, and type of debt you have. have fallen behind on a house or car payment and want to get caught up on missed payments and keep the property. When filing a Chapter 13 bankruptcy, you must also propose a repayment plan, typically referred to as a Chapter 13 plan. The Chapter 13 plan takes into account how much money you have left over after reasonable monthly expenses have been paid to put toward your outstanding bills. The Chapter 13 plan will also show how this money will be divvied up amongst your creditors. Priority claims, such as taxes and back child support, must be paid in full; unsecured debts, such as credit card debt and medical bills, are usually paid as only a portion of what is owed. Depending upon your income and expenses, your secured and priority creditors, and whether or not you have any nonexempt assets, unsecured creditors can be paid off for as little as 0 cents on the dollar. The length of your Chapter 13 plan will extend between three and five years. Three years is the minimum length and five years is the maximum length the law allows for debts to be repaid. If your income is below the median income then you are only required to propose a three year Chapter 13 plan, but you may go up to five years. But, if your income is over the median income then you are required to propose a five year plan. In addition to the general requirements listed above, the repayment plan must pass each of the following three tests: 1) It must be delivered in good faith; 2) Unsecured creditors must be paid at least as much as if a Chapter 7 bankruptcy had been filed — generally, this is the value of all the nonexempt property you own (see Texas bankruptcy exemptions); 3) All disposable income must be paid into the plan for at least three years. In a Chapter 13 bankruptcy, you must begin making your plan payments within 30 days of the date we file your bankruptcy case with the Court. If you are employed and receive a paycheck from your employer you are required to submit a wage order. A wage order is an order to your employer to withhold your Chapter 13 plan payment from your paycheck and to submit that amount directly to the trustee. If you are not an employee that receives a paycheck, for example if you are self-employed or retired, then you are required to submit an ACH authorization to the Chapter 13 trustee so that they can draft the Chapter 13 plan payment from your bank account automatically. If you have a mortgage arrears when you file your Chapter 13 case, then your regular ongoing mortgage payments will be included in your Chapter 13 plan. In addition to the 341 meeting of creditors (see table below), you may need to attend a hearing before a bankruptcy judge who will either confirm or deny the repayment plan. If everything is in order and none of your creditors or the bankruptcy trustee object to your Chapter 13 plan, then you will not have to attend the hearing in person. But, if there are any objections you will have to attend the bankruptcy hearing. Once your plan is confirmed and you make all the payments called for under your Chapter 13 bankruptcy plan, then the balances (if any) on the dischargeable debts you owe will be discharged at the end of your term and you will no longer owe those debts. There are several situations where a Chapter 13 is preferable to a Chapter 7. A Chapter 13 bankruptcy is the only choice if you are behind on your mortgage or business payments and you want to keep your property, either in Texas or another state, at the end of the bankruptcy process. A chapter 13 bankruptcy allows you to make up the overdue payments over time and to reinstate the original mortgage agreement. In general, if you have valuable property not covered by your Texas Bankruptcy Exemptions that you want to keep, a chapter 13 filing may be a better option. Also, people file Chapter 13 bankruptcy because they have too much income to file a Chapter 7 bankruptcy or have the kind of debt that is non- dischargeable in a Chapter 7 (e.g. certain taxes). However, for the vast majority of Texas residents who simply want to eliminate their heavy debt burden without paying any of it back, Chapter 7 provides the most attractive choice. You have immediate protection against creditors’ collection efforts and wage garnishment on the date of filing. You lose your non-exempt property which is sold by the trustee. If you want to keep a secured asset, such as a car or home, and it is not completely covered by your Texas bankruptcy exemptions then Chapter 7 is not an option. Co-signers of a loan can be stuck with your debt unless they also file for bankruptcy protection. If you choose, and you can afford, the payment plan, you can keep all your property, both exempt and non-exempt. While debts are not canceled, as in a Chapter 7 discharge, they can be reduced under a Chapter 13 payment plan. 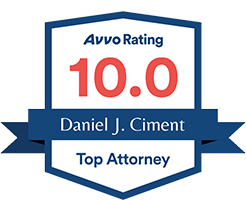 You have immediate protection against creditors’ collection efforts and wage garnishment.